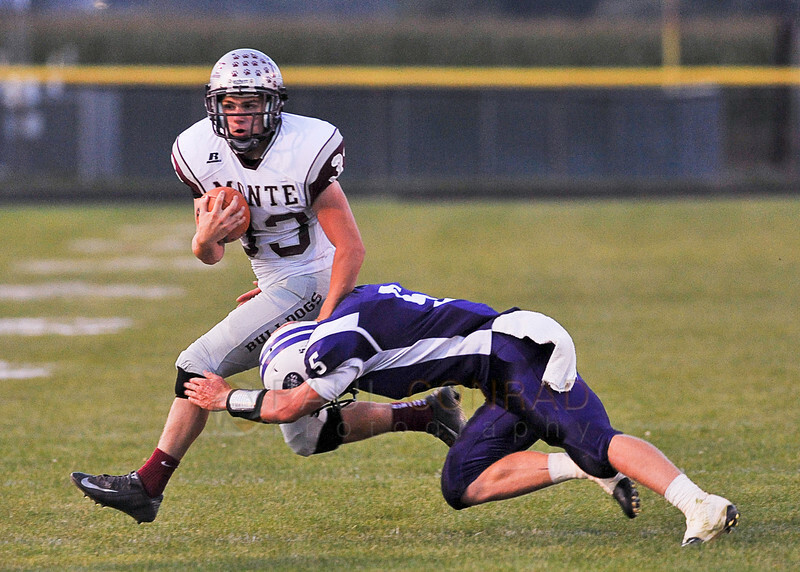 On Friday night, I covered high school football as Nooksack Valley hosted Montesano. As usual, I like to wait before posting when I cover assignments for The Bellingham Herald. At the end of this post, I’ll have a few tips to help you improve your football photography. Not just “get a long lens” type tips, but real ways you can get better shots. As the drive to Nooksack Valley High School was a good 35 to 45 minutes, I knew I couldn’t stay until the end of the game. My plan was to find a coffee shop near the high school so I can download, edit 3 or 4 images, create a slide show and make deadline. Standard protocol when working with newspapers. 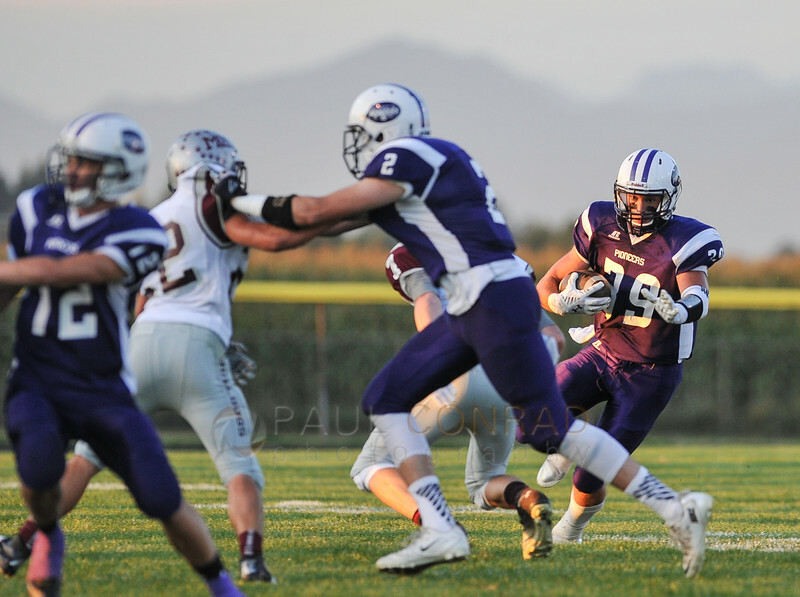 © Paul Conrad/The Bellingham Herald – Nooksack running back Adam Mydland (39) looks for daylight during the first quarter against Montesano at Nooksack Valley High School in Everson, Wash., on Friday evening September 13, 2014. The Pioneers defeated the visiting Montesano Bulldogs 40-34. And for some god forsaken reason, I like working on a deadline. I do miss that deadline adrenaline at times. And at others, I’m soooooo damned happy not to worry about it. 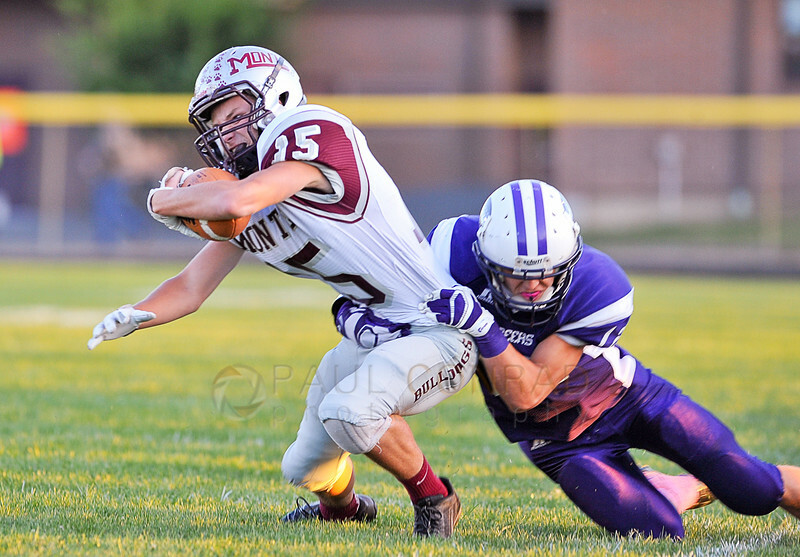 © Paul Conrad/The Bellingham Herald – Nooksack running back Adam Mydland (39) fumbles the ball after being tackled by Montesano junior linebacker Keegan Darst (7) during the first quarter at Nooksack Valley High School in Everson, Wash., on Friday evening September 13, 2014. The Pioneers defeated the visiting Montesano Bulldogs 40-34. This Friday was a bit different as well. Not only was I going to shoot a game, I planned on going up to Artist Point near Mt. Baker to view and photograph an expected outbreak of aurora borealis. You can read and view images from that outing at A Night Under The Stars: Tips To Improve Your Night Photography. 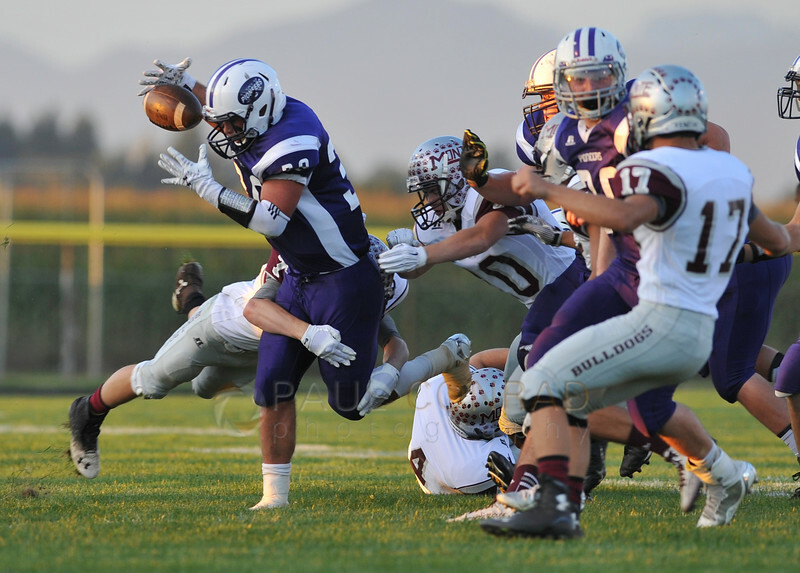 © Paul Conrad/The Bellingham Herald – Nooksack senior linebacker William Kingma (5) attempts to tackle Montesano junior running back Kyle Englund (33) during the second quarter at Nooksack Valley High School in Everson, Wash., on Friday evening September 13, 2014. I read a few articles on the players and realized the two to watch for on the Nooksack side were Tanner Myhre and William Kingma. Knowing the key players of each team is important as is knowing what formation and plays they use most. How can you capture great images without knowing the plays or players? Luck will only take you so far. © Paul Conrad/The Bellingham Herald – Nooksack free safety Tanner Myhre (11), right, comes from behind to tackle Montesano senior running back Tanner Birdsall (22) at the end of his 25 yard first quarter run at Nooksack Valley High School in Everson, Wash., on Friday evening September 13, 2014. The Pioneers defeated the visiting Montesano Bulldogs 40-34. It was no different with this game. Although Nooksack Valley was the favorite, Montesano had control of the game from the start. The stopped the NV offense cold, only allowing a field goal. 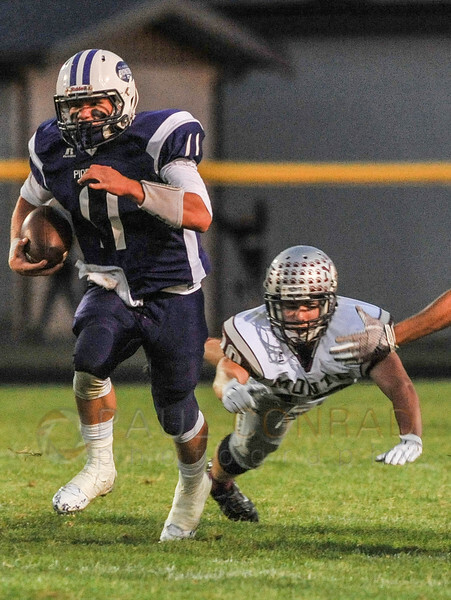 © Paul Conrad/The Bellingham Herald – Nooksack senior quarterback Tanner Myhre (11) stiff arms Montesano junior line backer Jordan Bussard (51) to evade a tackle during the second quarter at Nooksack Valley High School in Everson, Wash., on Friday evening September 13, 2014. The Pioneers defeated the visiting Montesano Bulldogs 40-34. The light on the field was fantastic as the Sun was setting to the west of the field. I stayed on the visitor side as this gave me the best light. It’s also good to stay on one side of the field so you can make sure everyone on that sideline gets used to you. 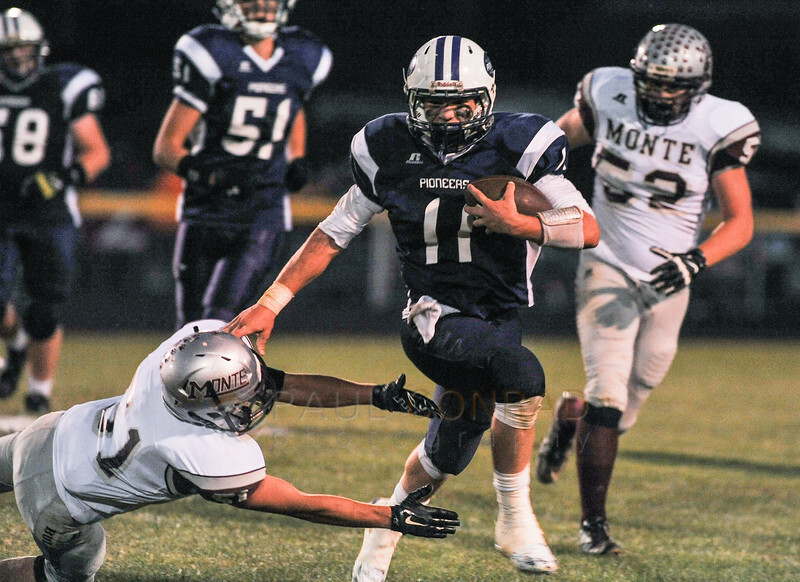 © Paul Conrad/The Bellingham Herald – Nooksack quarterback Tanner Myhre (11) out runs a Montesano defender during the second quarter at Nooksack Valley High School in Everson, Wash., on Friday evening September 13, 2014. The Pioneers defeated the visiting Montesano Bulldogs 40-34. However, after the Sun set the end of the first quarter, it was under the crappy stadium lights I had to shoot. And these lights were basic high school lights: dim, shifting color and intensity. Ugh. This made for uneven white balance as I shot. Even using a Nikon D3s, the camera was not fast enough to adjust. In fact, you can see the white balance change from magenta to green then back. And the exposure: from under to over to under. Oh, and I had no monopod so I just carried it . Yeah, it was a load, but good exercise. Minor differences, but you can tell when you see them next to each other in Lightroom or Photo Mechanic. To make it easier, I left my white balance on”Auto.” A move I don’t normally do, but with lighting this hideous, it was prudent to get close as possible to the proper color then correct it in Lightroom or Adobe Camera Raw. © Paul Conrad/The Bellingham Herald – Nooksack wide receiver William Kingma (5) looks for opening during the second quarter against Montesano at Nooksack Valley High School in Everson, Wash., on Friday evening September 13, 2014. The Pioneers defeated the visiting Montesano Bulldogs 40-34. After the first half, I had to leave so I make my deadline. I did not find a coffee shop to edit and transmit from. So, I just went home to edit and upload from there. – After each significant play, take a quick shot of the scoreboard. That way you can keep track of when the play happened.. If you keep a notepad, write down the yardage made, any other significant info. This will also keep you ahead of the game. – Know the teams or at least the star players of each team, both offense and defense. This is a tall order, but the paper’s usually write a pregame that will help you learn who the key players are..
– Use two bodies, if you can. One with long glass (300mm or longer) and one with a telephoto zoom. This way, if you are photographing and the action comes close, you can just swap cameras then shoot with the shorter lens. – Don’t wait til the card is full. Change it when there is enough room for 20 or so photographs. Filling it up slows the camera down as it attempts to find the space to write the file which can cause you to miss a shot,. – Keep extra cards immediately handy. Although there can be a few moments between plays, the last thing you want is to miss a shot because you’re rifling through your camera bag for them. – Stay in front of the line of scrimmage. I usually stay about 15 yards so I can get the running action and be prepared for pass plays.. Unless I know the defense is stopping the offense or sacking the QB, then I try to stay in front to capture the plays. – Listen to the coaches and teams as the play unfolds. You can get a good hint of where the play will be, where it may go, and if. Especially if it’ll be a long pass. – When the offense is approaching the red zone (the 20 yard line to the goal), then I get behind the end zone. This gives me the opportunity to get the run straight in, jumping over the top, or from the side if the defense pushes them to the corner. – Pay attention to the clock. At the end of the quarter, they switch direction. Don’t be left at the wrong end of the field because you answered your phone or were busy talking with another photographer. Football is fun and easy. If you don’t have a long lens, just follow the game as it progresses up and down the field. Have fun. Paul Conrad is an award-winning, nationally and internationally published freelance photographer living in Bellingham, Whatcom County, Wash., in the Pacific Northwest. His work has been published in newspapers and magazine throughout the United States and in Europe. Thanks for the credit on the photos!